BENGALURU: A small aircraft will be allowed to breach the ‘no-fly zone’ rules over the sprawling and high-profile ‘Science City’ near Chitradurga soon to help Indian space scientists address challenges of landing on the Moon and Mars. Reason: this aircraft will carry a special payload-the lander-rover of Chandrayaan-II, the country’s second shot at the Moon, drop it over an area scooped out area, akin to the lunar surface with scores of large craters, and monitor whether the lander-rover veers itself away from the pits to touch down on a flat tract with the help of an inbuilt autonomous system. With more than 1.8 lakh craters, each measuring more than one km, dotting the surface of the earth’s nearest astral neighbour, scientists at ISRO will carry out this critical test to ensure a landing on even surface ahead of the launch of Chandrayaan-II-an orbiter-lander-rover mission next year. Objective: A descent onto a level surface with the help of inputs from the Orbiter High Resolution Camera (OHRC) will enable the rover to wander around, carry out onsite analysis of the Moon’s soil and beam home scientific data through the orbiter. “This is the first time we are going to attempt to land on the Moon, so we want to be meticulous with our computation and technology,” a top space scientists told Deccan Chronicle. 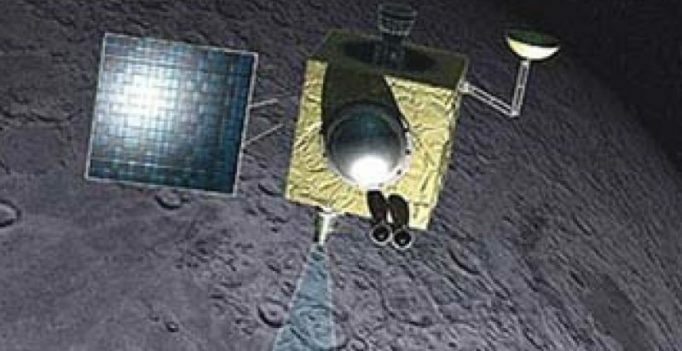 Unlike Chandrayaan-I’s Moon Impact Probe (MIP), which crashed into the Moon, the lander will be designed to make a soft land and then to deploy the rover, he added. The 20-kg rover will operate on solar power and move on wheels on the lunar soil. Around the same time as ISRO’s test-landing at the ‘Science City’, DRDO has planned the maiden test flight of Rustom-II, an advanced Unmanned Air Vehicle (UAV) at the Aeronautical Test Range (ATR) in another part of the 8,000 acre campus. This medium-altitude, long-endurance (MALE) UAV has a range of 250 km, and the capability to carry weapons as well as fly non-stop for five-six hours. The synthetic aperture radar (SAR) onboard Rustom-II will help the UAV see through dense clouds. On completion of test flights, it will replace the Israeli Heron UAVs being used by the IAF and Indian Navy, according to sources in the Ministry of Defence (MoD). Space scientists said the orbiter would circle the Moon at an altitude of 100 km with five instruments onboard. Three of these would be new, while two others would be improved versions of ones flown onboard Chandrayaan-I. The orbiter would help beam scientific data garnered by the rover from the Moon’s soil. Defence minister Manohar Parrikar will inaugurate facilities of MoD at the high-profile ‘Science City’ near Chitradurga next month. A three km-long run, several hangars and ATC (Air Traffic Control) tower have been built to support projects like the Unmanned Combat Air Vehicle (UCAV) and electronic warfare (EW) systems, besides the Made-in-India ‘Tejas’ Light Combat Aircraft (LCA). The campus of MoD has been cordoned off with no access even to scientists of Indian Institute of Science (IISc), who are readying a 1500-acre area next door for a host of laboratories and test facilities. Farah’s ‘DNA test’ comment for Chunky, Shabana’s Cannes pic: Views getting skewed?